Hi from the Emu Ridge team. Spring is here and our Kangaroo Island Narrow Leaf Mallee is in full flower, just gorgeous! We have had a very dry winter this year, and are waiting for some nice new growth on our trees before we start our eucalyptus distilling season. Exciting times ahead as Larry has completed his new still, see below! 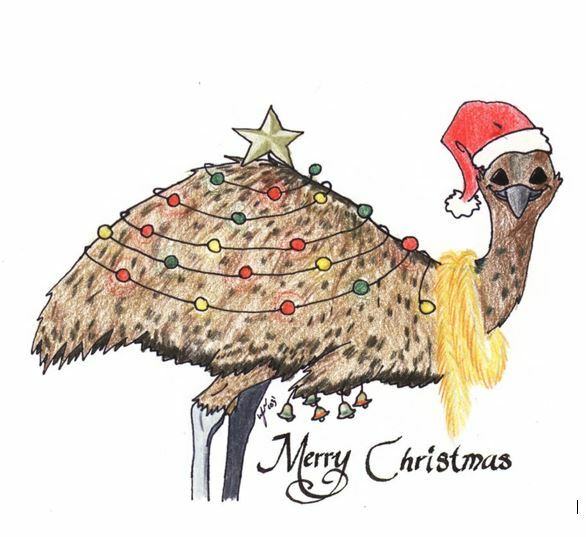 Warm regards from Larry, Bev and the Emu Ridge staff. WE ARE VERY EXCITED TO OFFER THIS AMAZING SPECIAL ONE LAST TIME! We are super excited to have this AMAZING SPECIAL available for one last time. The Duo Pack was $49.95, now only $20.00 and you receive a 100ml Hand Cream & 150ml Body Mousse, they individually retail for $25.95 each! Exclusive to Emu Ridge and only till stocks run out. So get in quick as they’ve been running off the selves. We have added Kangaroo Island fresh water Marron to our Emu Ridge Café menu. It’s a great bush food in keeping with our business. 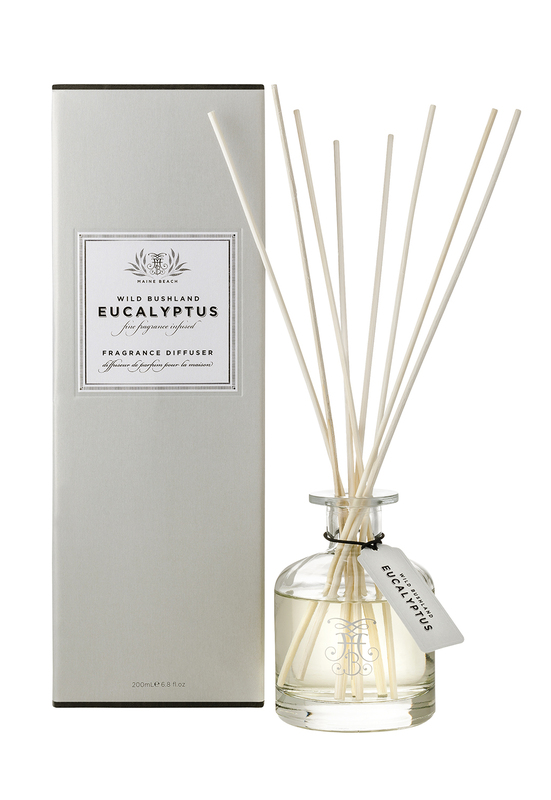 It’s indigenous to Australia and sustainable farming of our natural resources, just like our eucalyptus oil! Live marron from our tanks provides nothing but the freshest produce. Kangaroo Island Marrons sweet delicate flesh and rich fresh flavour is claimed to be one of the world’s most indulgent foods. NEW STILL MAKES WORK EASY! Larry has finished engineering his new still! Just in time for our season which runs through Summer. The process has changed making the process much less labor intensive, but the overall concept remains the same which is Steam Distillation. Click below to see the videos and blog of how it works now! 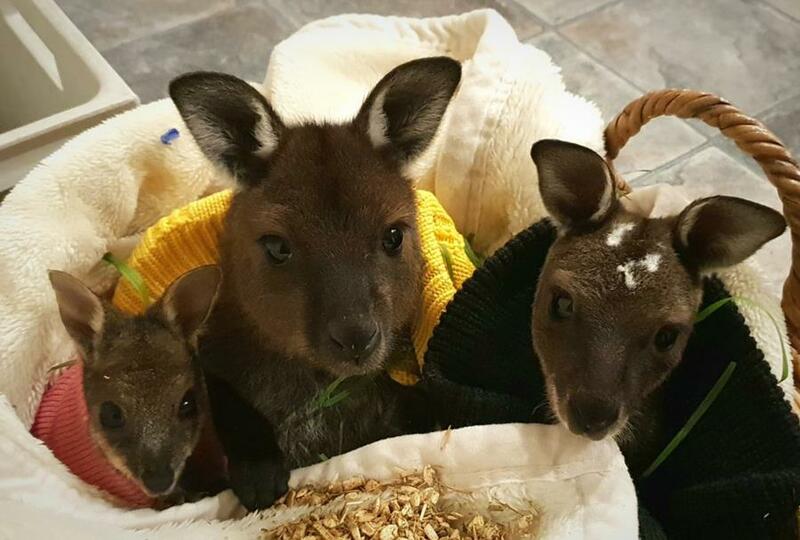 We have had the pleasure of caring for these gorgeous new orphans this season, meet Wallaby Eucy, Kangaroos Leo and Bambi. Another beautiful wedding was held at Emu Ridge recently for the gorgeous newly weds Michaela & Sam O’Brien. The couple chose to have their wedding ceremony and reception on our Emu Ridge farm. The theme was rustic with recycled objects, pallets and succulents. 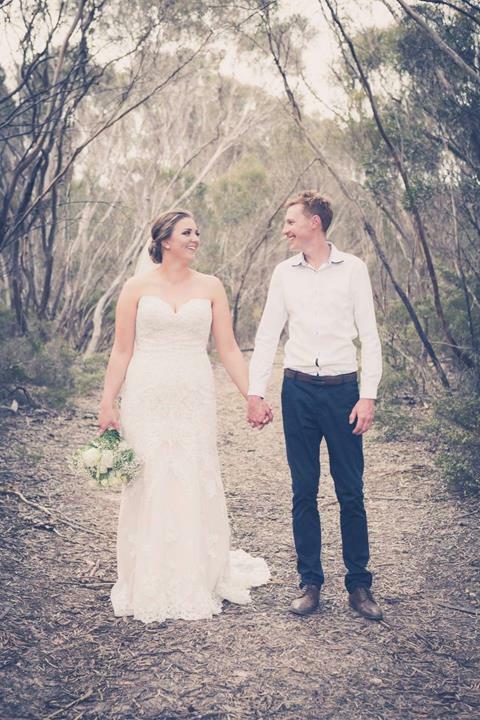 Michaela was one of our casual staff at Emu Ridge a few years ago so we were delighted she chose our venue for her special day. 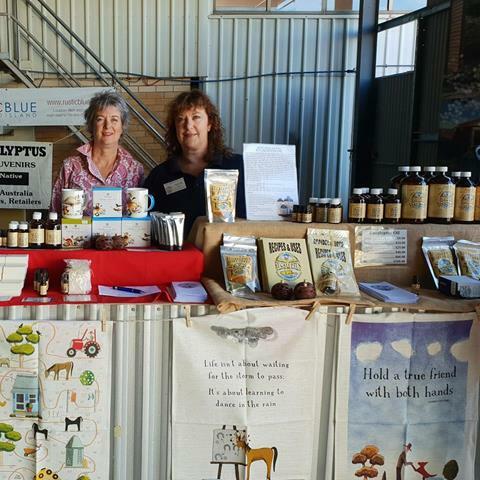 Bev and Coralie from Rustic Bluewere recently at the Melrose & Jamestown Show Farm Fair in the Flinders Ranges. 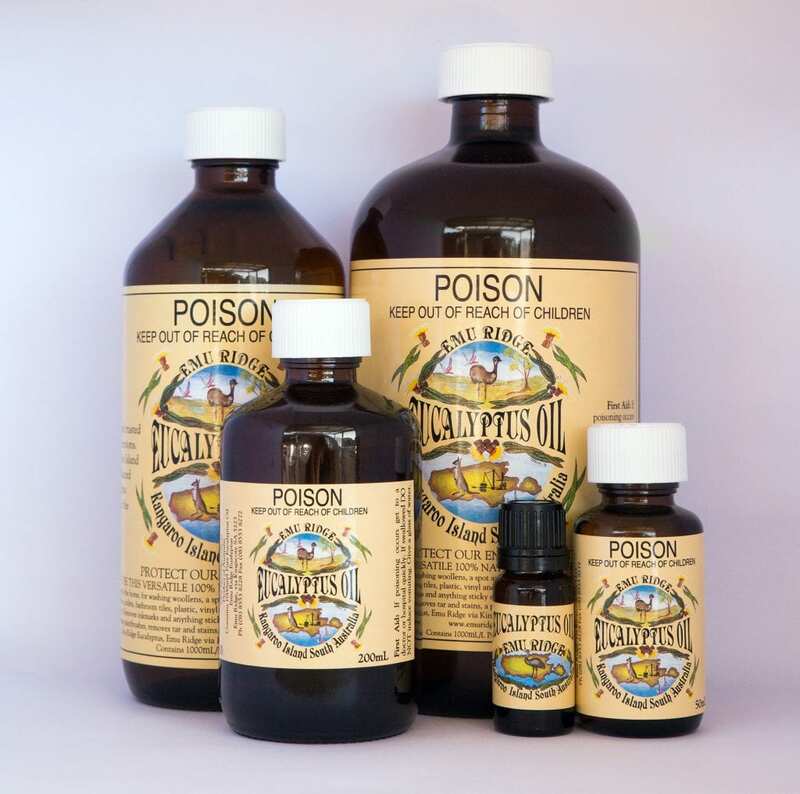 It’s always great to showcase Kangaroo Island, our Eucalyptus oil and other natural products. 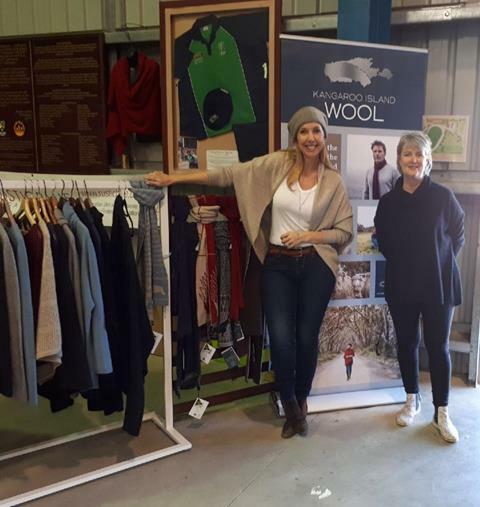 Coralie had an extensive range of the Kangaroo Island Woolthat was highly praised and promoted by Catriona Rowntree who is the Australian Wool Innovation Ambassador. Thanks to those that visited, it was lovely to meet you all! EARLY BIRD XMAS SALE 10% OFF! As a thank you to our valued customers for supporting us we would like to offer 10% Discount on any of our online products (*excluding sale items). We have a wide range of gift ideas so stock up on this great offer. Xmas may still be a couple of months away but it’s best to get in early! Just pop in the code EARLYBIRD in the coupon part of the cart or checkout page before it ends on the 31/10/18! Thanks for reading best regards Larry, Bev and the Emu Ridge team! Hi from Emu Ridge and beautiful Kangaroo Island. Autumn is here and we continue to have beautiful weather. We are all hoping some rain arrives soon as it has been extremely dry. 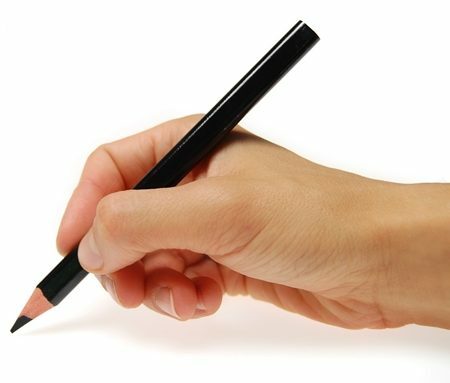 Larry is working on a new still and we will be excited to reveal the changes in the next newsletter. On the 8th of April we were proud to have recently celebrated Emu Ridges 27th Birthday, time certainly flies. 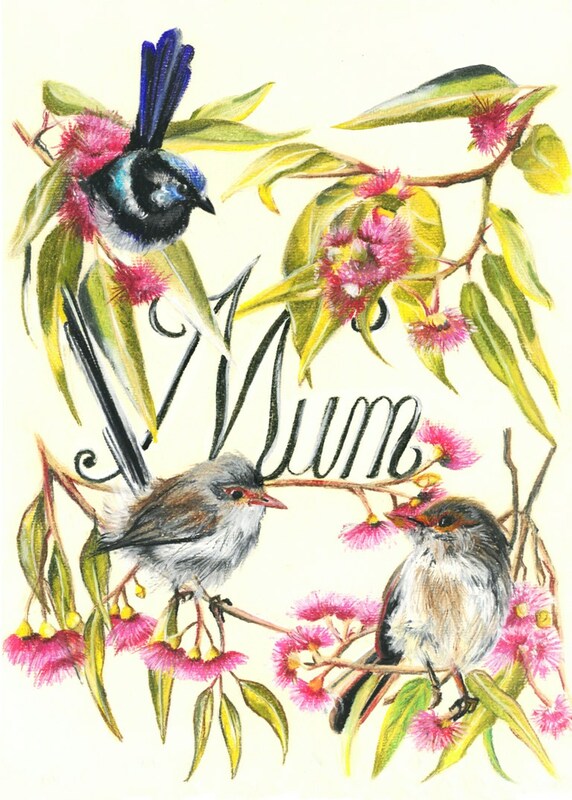 Cover Photo – While volunteering her time on Kangaroo Island at the Emu Ridge Eucalyptus Oil distillery UK artist Laura Hepworth designed this beautiful pastel for Bev and Larry Turner the owners. The Superb Fairy-Wren is voted Australia’s favourite bird, Malurus cyaneus – Maluridae. Happy Mother’s Day to all the beautiful Mum’s & Grandmothers out there! We are super excited to have this AMAZING SPECIAL available for Mother’s Day! The Duo Pack Was $39.95, now only $20.00 and you receive a Hand Cream & Body Mousse which individually retail for $25.95 each! You won’t find a special like this anywhere else and is only till stocks run out. So get in quick as they’ve been running off the selves. Emu Oil was Featured on Landline, ABC! Phil Lacey was recently featured on Landline ABC. He manufactures our Emu oil. It was a great program which highlighted Emu Farming and it’s sustainability as well as all the wonderful uses for the oil. You can view the story hereand of course we’ve got plenty of information on the oil here on our blog. With only 12 Emu Farms in Australia make sure you purchase 100% pure Australian Emu Oil for the best quality. This is a great activity for those of you with children looking for something to do in the School Holidays, make some for Mothers Day, add a few of your favorite flower petals! With Winter nearly here, the cold & flu season arrives as well! 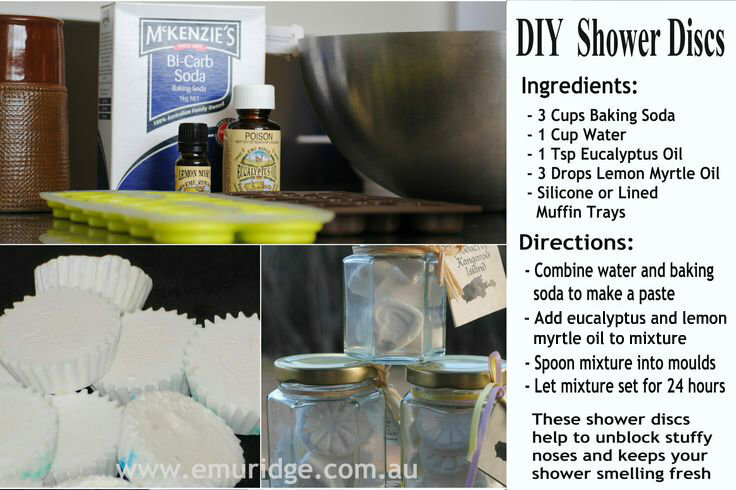 These DIY shower discs will unblock any stuffy nose without the use of harsh chemicals. Just place them in the bottom of your shower. They are great to pop in the toilet to! You’ll find the full recipe here. We cannot forget our popular Vapor Rub & Eucalyptus Sweets which we stock in our shop & online. Our Emu’s have grown so much over the last 7 months as you can see in the picture. They are still curious as ever and even enjoy some play time with Chopper our Kelpie/Border Collie dog. 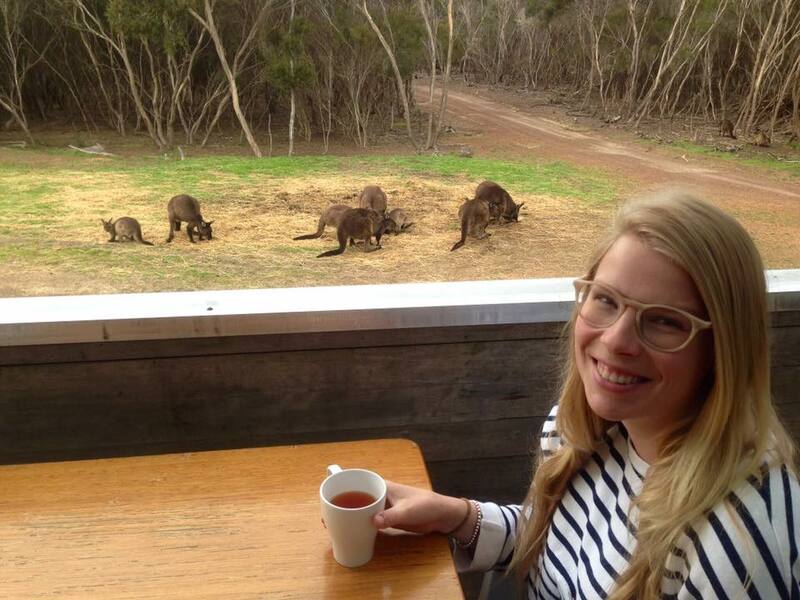 It was time to say goodbye to our orphaned Wallaby’s that Bev hand reared this season. We always release our orphans onto our farm so they can live free without any restrictions. Its always a happy sad day. 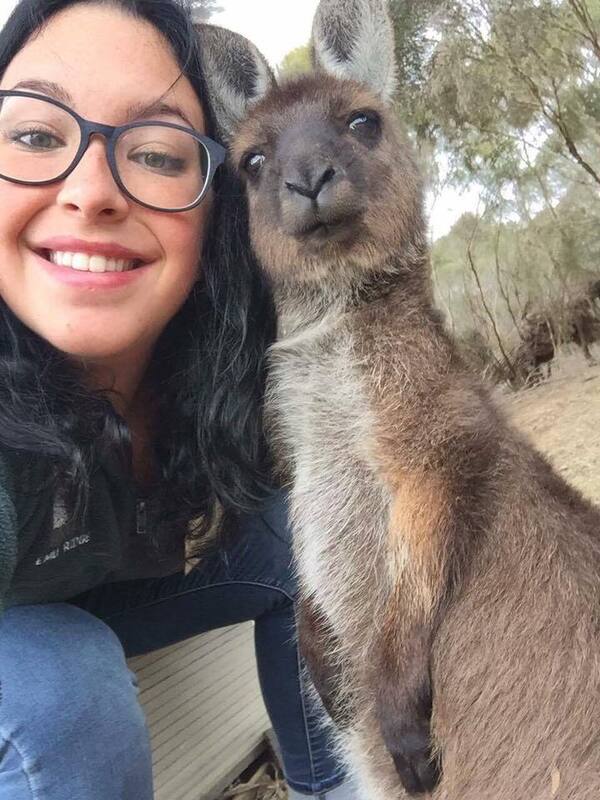 Wallaby’s are quite different to Kangaroos and Possums, they have very strong wild instincts, so once released you don’t really see them again. However, Alina the youngest of the four is still living around our shop. Bev and Coralie from Rustic Blue were just recently at the Kapunda Farm Fair near the Barossa Valley. It was a great opportunity to showcase our great products such as Eucalyptus, Emu, Tea Tree oils, KI Honey, Soaps and other wonderful natural products. It was pretty good weather and thanks to everyone for visiting our stall, it was lovely to meet you all! 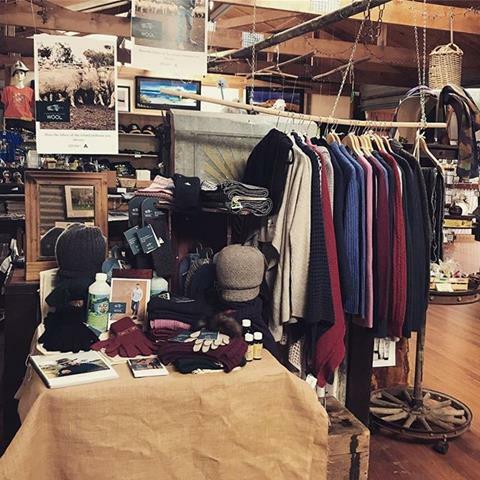 We are excited to stock the new range of Kangaroo Island Merino & New Zealand Possum fur garments. 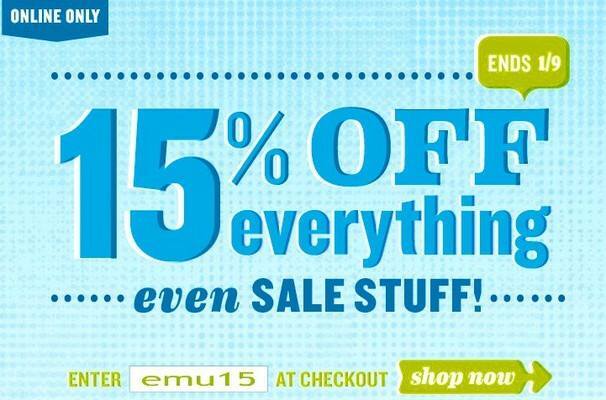 Shop online here and use the code EMU-RIDGE to get FREE worldwide shipping! 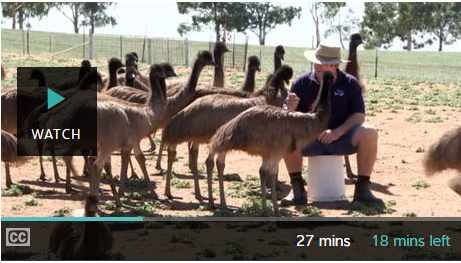 A great story recently on ABC Landline about Emu oil. South Australia has one emu farm and we are proud to be the label for this fantastic product. 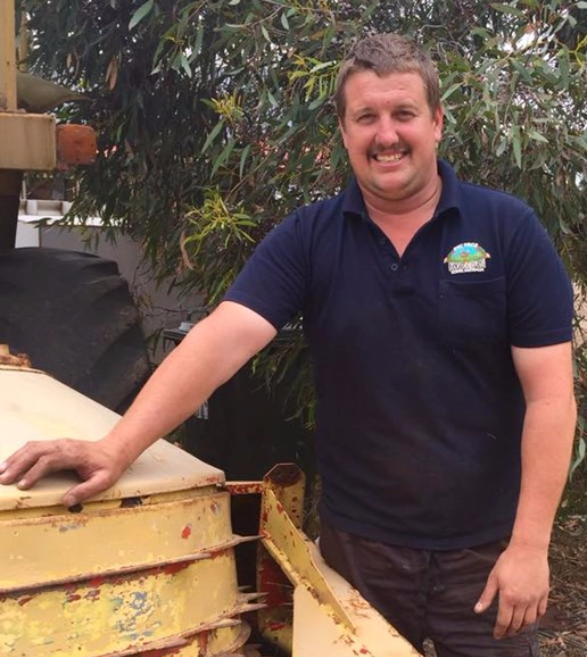 Wayne has been farming emus for over 20 years and we are proud to support this South Aussie battler, promoting, bottling and selling his Emu Oil. 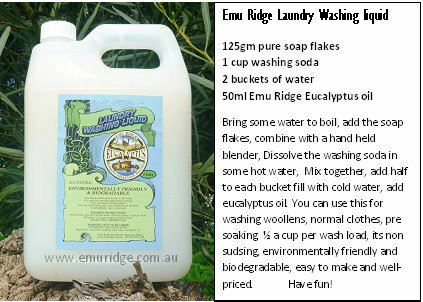 It truly is an amazing 100% pure natural Australian Product, which is what Emu Ridge is all about! Emu Ridge believes in farming our natural resources in a sustainable way, promoting and selling PURE NATURAL AUSTRALIAN PRODUCTS. If you missed the landline story click on the image and it will take you to it. 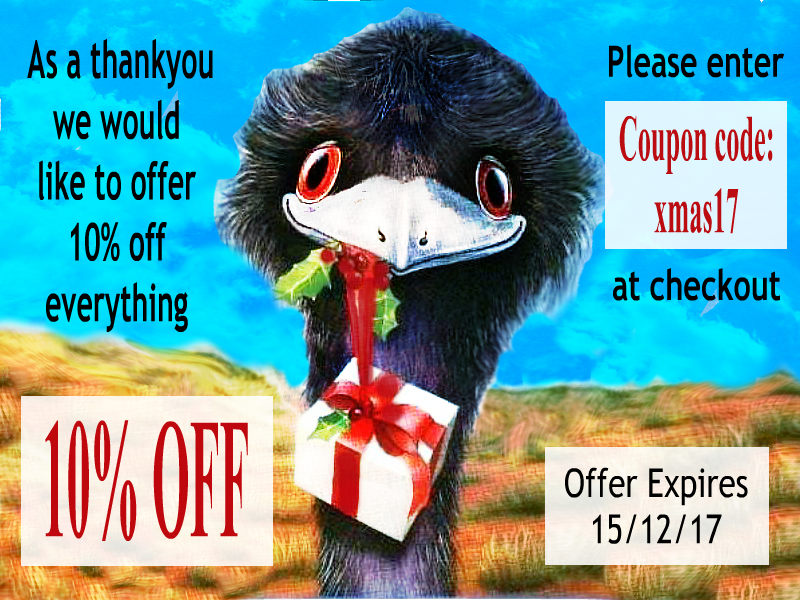 You can also purchase our 100% Pure Australian Emu Oil here. 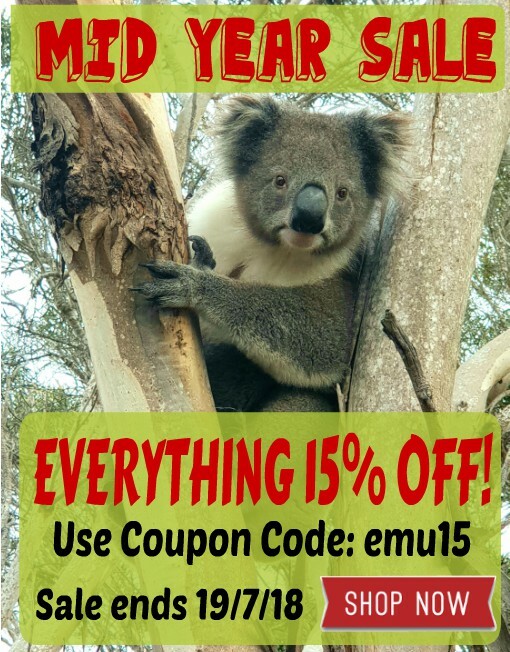 You can purchase our 100% Pure Australian Emu Oil here. Emu Oil has been used by the Australian Aboriginals for thousands of years. They have relied on its consistency of healing and therapeutic qualities to survive Australia’s harsh climate. From the number of studies conducted it has been shown that Emu Oil really does work. It is one of nature’s finest emollients and moisturizers. It’s well known in the pharmaceutical industries, the Institute of Sport in Canberra, and is currently being used worldwide by sporting bodies. Emu Oil is rich in Vitamins A, D,E, F & K2 and Omega 3, 6, 7 & 9 oils. It is very moisturizing and healing, it protects, nourishes and softens the skin. Emu Oil has the unique ability to penetrate the layers of skin so essential nutrients can be carried more efficiently deep beneath the surface. Emu Oil has an anti-inflammatory effect on the skin and has an anti-degenerative effect on skin cells. Emu Oil will build up a natural layer of moisture whilst opening up the pores of the skin letting your skin breathe naturally. MASSAGE: It is a great carrier oil for mixing with other oils. ARTHRITIS, INFLAMMATION, ACHING MUSCLES: It will penetrate deeply and work to cut down inflammation, open up blood capillaries and promote increased blood flow and oxygen to problem areas. This is essential for the healing of muscle and joint problems. (Mix half Emu Oil and half Eucalyptus oil for an excellent liniment.) People have also had allot of success taking it orally as well 1 or 2 teaspoon a day. this may also help gut issues, see the above links. ECZEMA, DERMATITIS AND PSORIASIS: It will significantly reduce irritation and inflammation of the skin. Emu Oil is extremely low-allergenic therefore ideal for sensitive skin. It produces no known side effects and in its natural state, doesn’t support any bacterial organisms. OUTBACK SCENE: Wayne Piltz, Southern Emu, Moorook, with some of the emus on-farm. 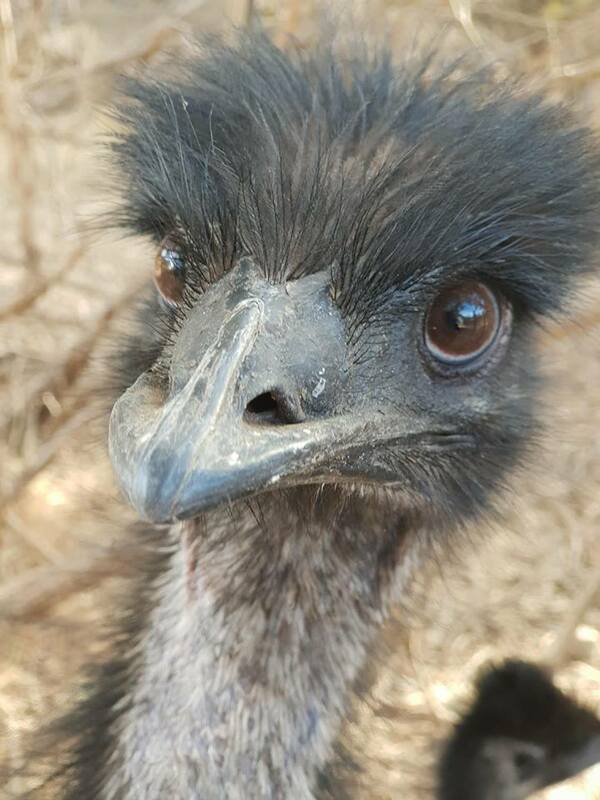 Southern Emu director Wayne Piltz, Moorok, who farms emus with son Darryn, has been in the emu industry for more than two decades and said it has been through some tumultuous times. 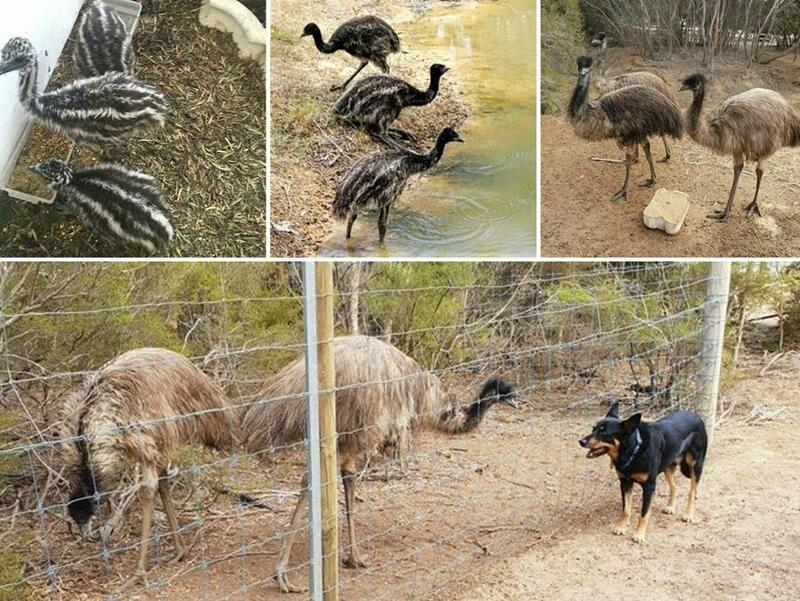 They have 600 birds on the property, with about 28 hectares fenced into emu pens. “This year we might hatch 600 chicks if we know we have the markets for them,” he said. He has selected breeders, which can each produce up to eight eggs at a time. Emus build up fat supplies in spring and summer ahead of their breeding season from March to June. If your interested in Emu Eggs and Emu Products see this link. Emu farming helps to protect our environment. The Emu is native to Australia and can live in harmony with our land, thus reducing the chemical dependence and land clearance needed for introduced species. The Emu is the largest of all Australian birds, it cannot fly, and can run at speeds of 48 kms per hour. Since 1991 we have believed that farming our natural resources in a sustainable way is our greatest asset. Eucalyptus is but one of the things that grows naturally on our property. 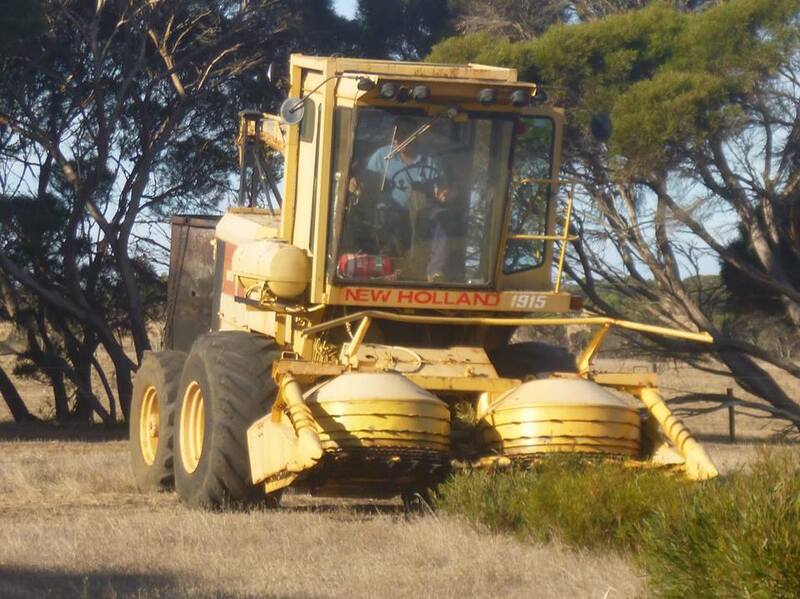 The government is making it very hard for us to farm this way on Kangaroo Island! Our Wallabies and Kangaroo’s are culled (shot ) and left to rot in the ground. They revoked our Emu Farming licence and we are now only permitted to sell emu eggs for both edible and hollow eggs sales, not for meat and leather. We will continue to fight these regulations. Farming our natural resources is far better for the environment. We used to be sheep farmers way back in another life! We would like to thank for supporting our family owned Aussie business and wish you a festive season full of love and a wonderful 2018. We hope you enjoy our newsletter. We are excited to have this wonderful Christmas Hamper available! Great as a gift to someone or just for yourself as a treat! The normal price is $71.45. 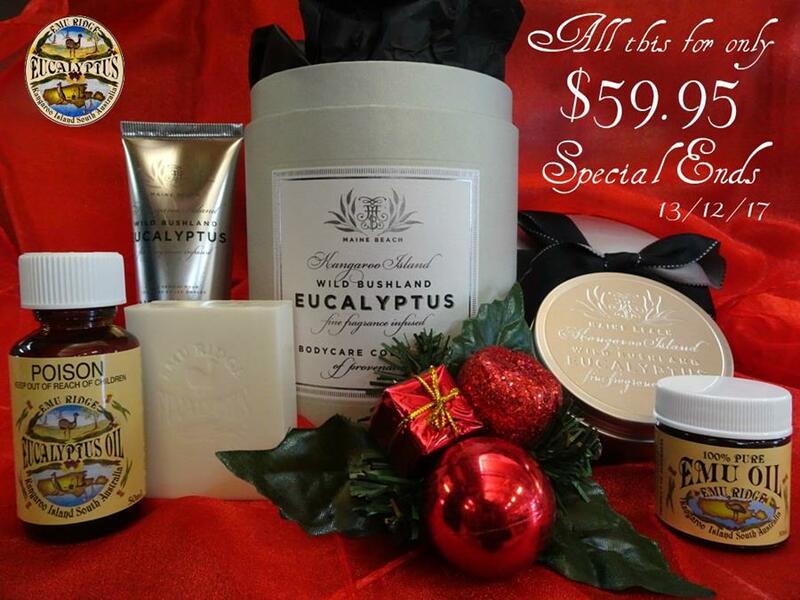 Special $59.95, this gift will be Gift Wrapped and it includes a body mousse, hand & nail cream, 50ml Eucalyptus oil, 30ml Emu oil and a Eucalyptus soap. As a thankyou to our valued customers for your support, we would like to offer a 10% discount on all of our products excluding the 2 specials, this offer is available till the 15th of December 2017. We have so many great ideas, we are also happy to make up a hamper just for you. Gift Vouchers are always a great option to. 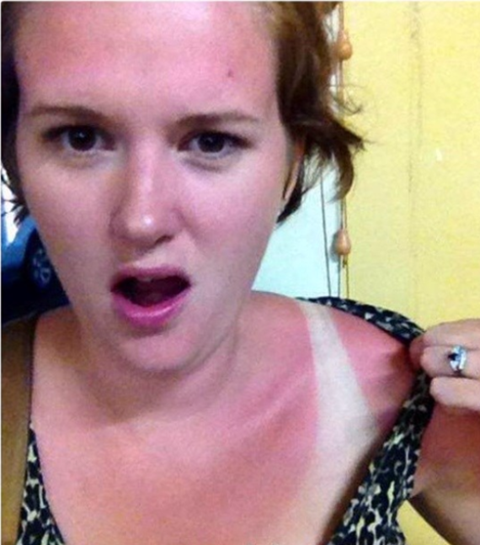 Something that tends to happen to everyone is getting SUNBURNT! Even if you think you’ve been extra careful it can still happen. We have a fantastic product that’ll heal sunburn quickly and prevent that horrible peeling, it’s EMU OIL. This oil is not only for sunburn, it can be used for a whole range of things including arthritis, massage for aches, eczema, dermatitis, psoriasis, scarring, and lots more! Welcome to the team Tristan! 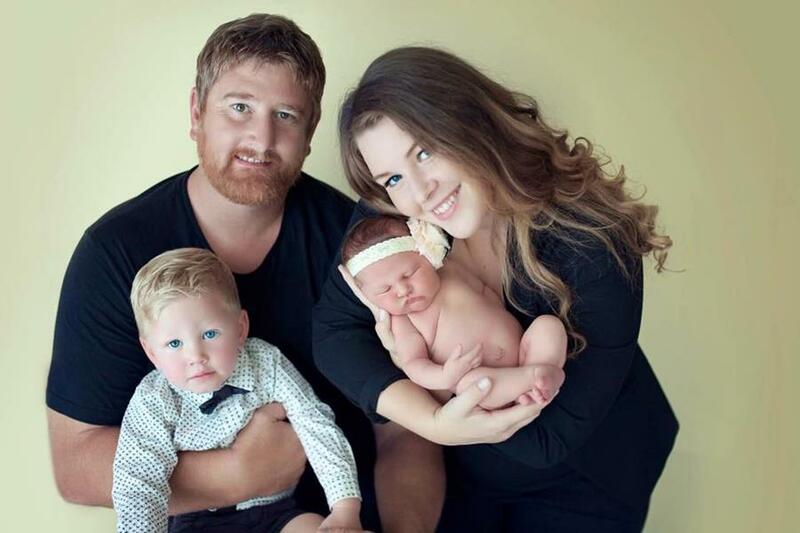 We would like to introduce you to our son Tristan, after 12 years of building on KI and in Darwin, we are proud and excited to have him back working with us in our family business at Emu Ridge . We have some very cute Aussie animals here at Emu Ridge. A recent addition is some baby Emu’s, that have more than tripled in size since we’ve had them. The pictures show them with beautiful stripes but over time they’ll disappear. They also love water and have been swimming in the dam on these hot days! We have had many volunteers from all over the world helping us over the years. They do all sorts of things from serving customers, bottling oil, prepping food for lunches, making gift packs, Cider tastings, translating information sheets, maintenance and much much more! We thank everyone who has volunteered with us, its a chance to share cultures, skills and language and see they way of Aussie life. Its a big help, we really appreciate their time and love every one of them! Larry has been hard at work during our off-season redesigning the still. He has also been doing some maintenance to his Mechanical Harvester, making new blades and cutters! Each one hand made by Larry! 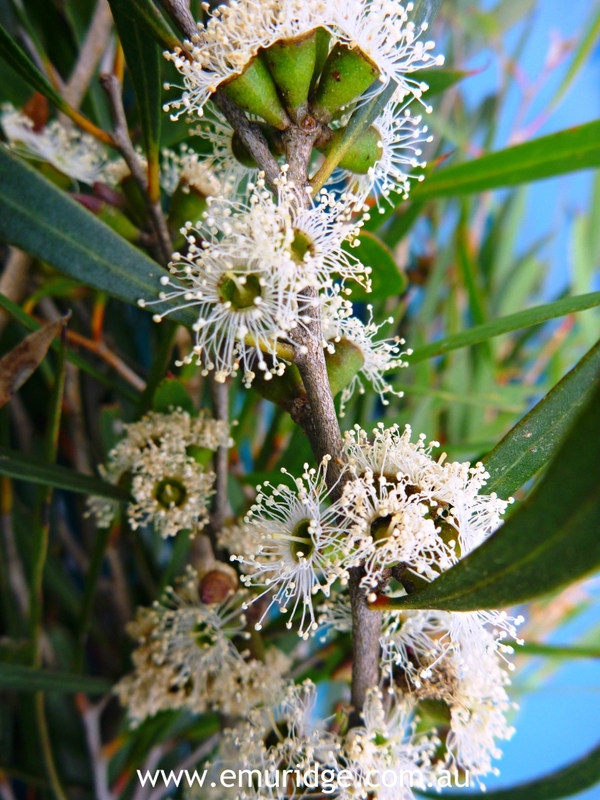 Not long now and we will begin to harvest the trees and make our next batch of Eucalyptus Oil! We are all excited to see how the new still goes and will keep you updated! The only annoying thing about summer are the insects! Nothing worse than relaxing outside and getting bitten by mosquitoes and midges or annoyed by flies! But this recipe is fantastic to keep them away! 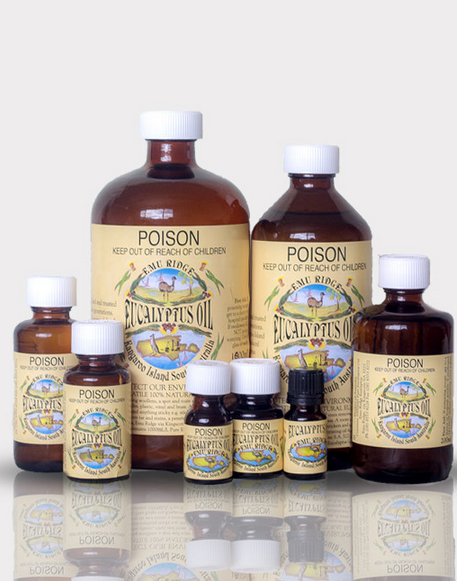 We also sell an All Natural Insect Repellent that is already made up. Another addition to our menu is Emu & Kangaroo Pie’s! The Emu, bush tomato and saltbush Pies are made by Andrew Fielke and are accompanied by Bush Tomato Chutney, and KI Homemade Tomato Sauce & salad. Our local bakery are making our Kangaroo & Native Pepperberry Pies. They’re all delicious, so if you happen to visit us soon don’t forget to try one of these unique Aussie pies! They have been a real hit! Thank you very much for taking the time to read our Christmas Newsletter. This link will take you to our Blog with great hints, tips and recipes and you can keep up with what we are up to at Emu Ridge. Merry Xmas and Happy New Year from Larry, Bev and our great team at Emu Ridge. Below is a little about whats been happening at Emu Ridge and we look forward to hearing from you in the future and thank you for your continued support. We are so pleased with the support we recieve from our online shop, so due to our failed newsletter we would like to offer you 15% Discount on any of our online products, including the special! So if you didnt recieve the newsletter of the price increase that took place on the 1st of August we would like to offer you our SPECIAL, to give you a chance to stock up. Special ends on the 31st of August. We are looking forward to your continuing support. 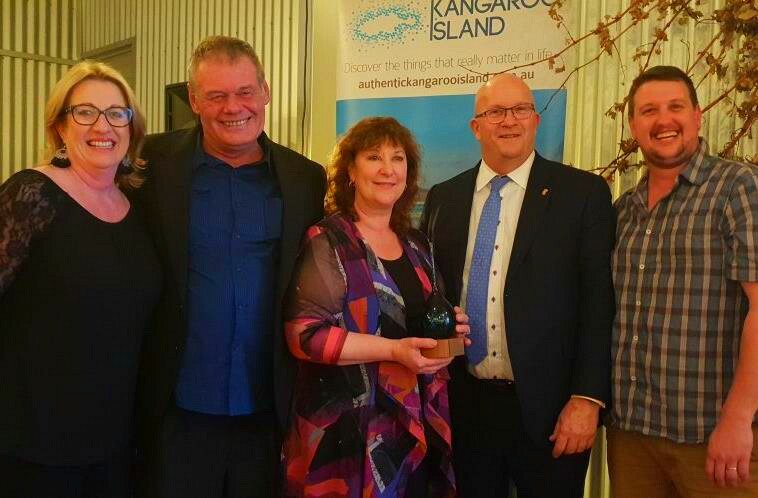 We are proud to announce that we won the BEST FARM GATE EXPERIENCE at the Kangaroo Island Food, Wine & Tourism Awards recently, for the second year running. We thank our great team for always putting our customers first to deliver a great experience. 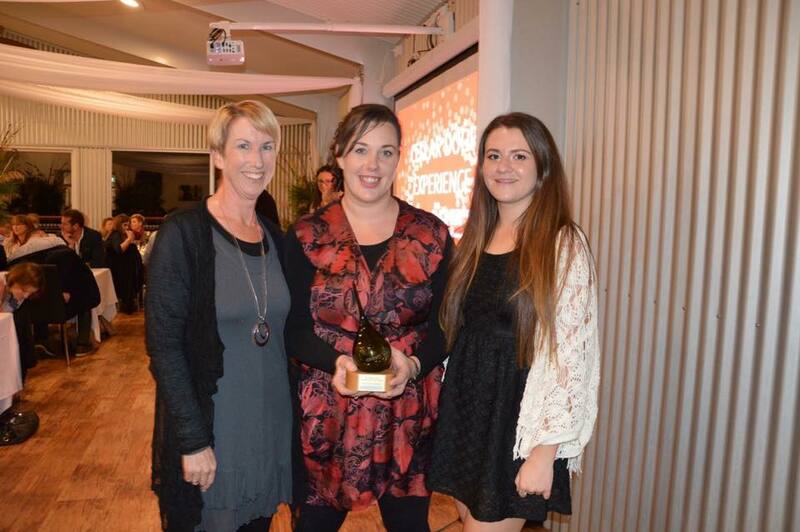 Well done to all involved & we thank SeaLink Kangaroo Island the sponsors of this category. 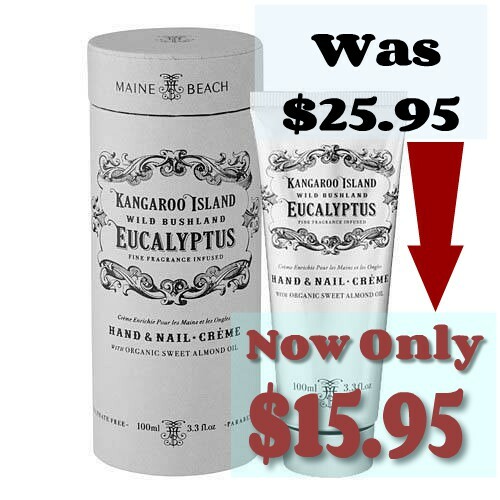 Kangaroo Island Eucalyptus Maine Beach Bodycare Range. 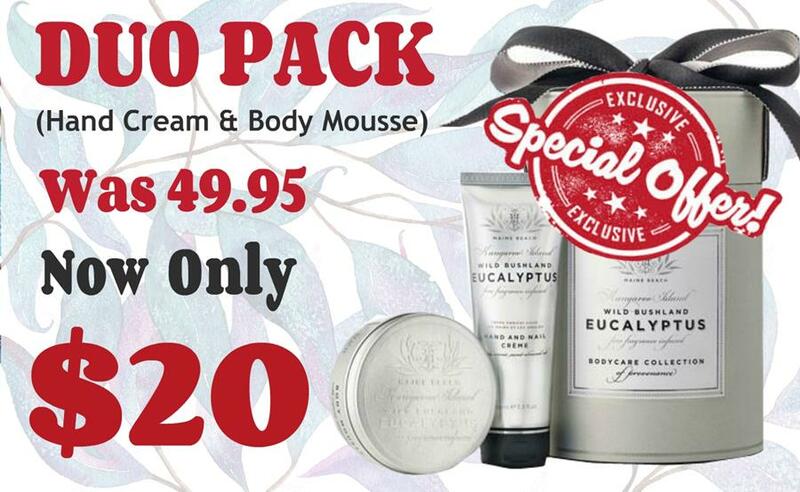 We would love to offer you a fantastic price on the Eucalyptus Hand & Nail Cream. Get in quick, we dont have many left at this price!. If you love this products, it’s a great time to stock up for yourself or friends? If you haven’t tried it now is the time! The bodycare range is paraben, mineral oil, sulphate and colour free. 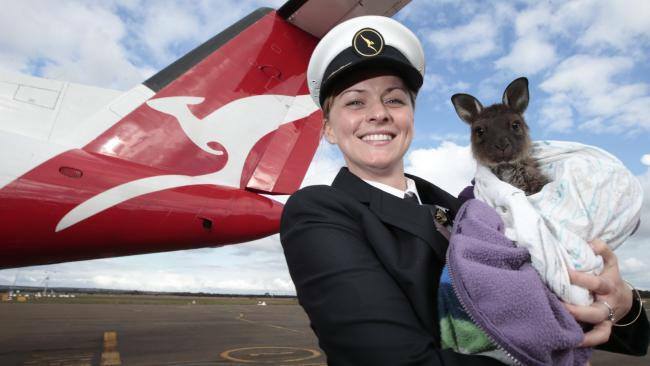 Its official Qantas are going to be flying to Kangaroo Island at the end of the year once our new airport is complete, very exciting! 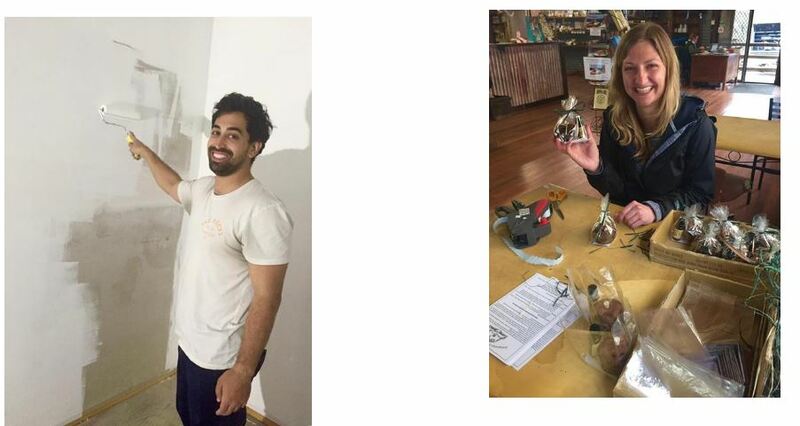 From Adelaide, Melbourne, Sydney and Brisbane! We hope to be seeing more of you! 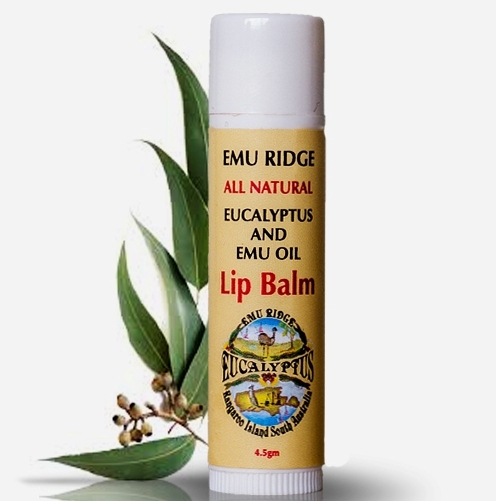 We are proud to have been producing our 100% Pure Emu Ridge Eucalyptus oil since 1991. Did you know that 90% of the worlds Eucalyptus Oil is now produced overseas, with different species of tree to ours. With a multitude of uses Eucalyptus oil is antibacterial and antifungal, removes oil based stains and sticky things, it’s a penetrating oil as well as having medicinal properties. Therefore it’s an ideal natural product for in and around the house, for the body and in the workshop. We dont only sell a great range of natural products. 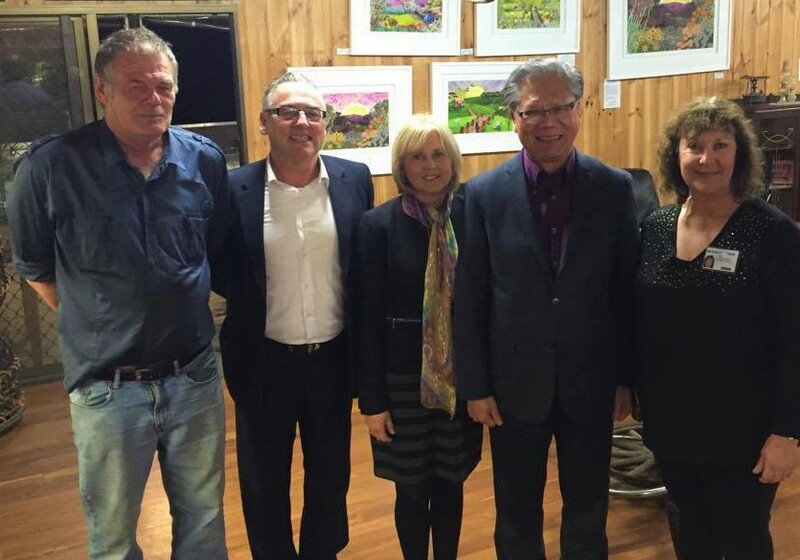 We have enjoyed some great events at Emu Ridge too. The most recent was hosting the Small Islands of the Worlds Conference. We have had some lovely international volunteers helping us out, including a Tourism student from Canada, you can view these and much more in our Facebook Albums. Our Eucalyptus oil harvest season is over, we produce our oil at the end of Spring and through Summer, it’s maintenance time now. Larry is doing some maintenance on his mechanical harvester and is building a new still ready for next season, so exciting times ahead. We hope you enjoy discovering about our wonderful range of natural products and their uses. Our products are only available ONLINE and of course in our retail shop. Hi from Emu Ridge and beautiful Kangaroo Island. We have been very busy. Sorry its been a while since our last news. Summer has arrived for us and our Eucalyptus harvesting season is in full swing, this link will show you our process with our new (old) mechanical harvester. What took Larry my husband and his worker 2 hours to do with the chainsaw now takes him 10 mins! Exciting! We are still making it in the traditional way. Warmest regards Larry, Bev and the Emu Ridge staff. One of our family members has horses that are constantly being bothered by flies during the summer. We found a great recipe and asked her to put it to the test! It’s 100% natural, easy to make, it’s much cheaper than the toxic commercial brands and it is also better for the environment. It works of dettering all insects, flys, mosquitoes ants etc.See more info on this link. We are excited to offer a great SPECIAL on our 50mL Hand and Nail Creams. A great gift and perfect size for travelling. Normally $8.95 NOW until the 1st of January they are only $6.95. Refresh your pillows. You can also add 1 tsp of Emu Ridge Eucalyptus oil as well for a great clean fresh smell, plus it kills the dust-mites and removes oil based stains for a healthier you! Most of you that browse our website might notice that we love to add to our blog. 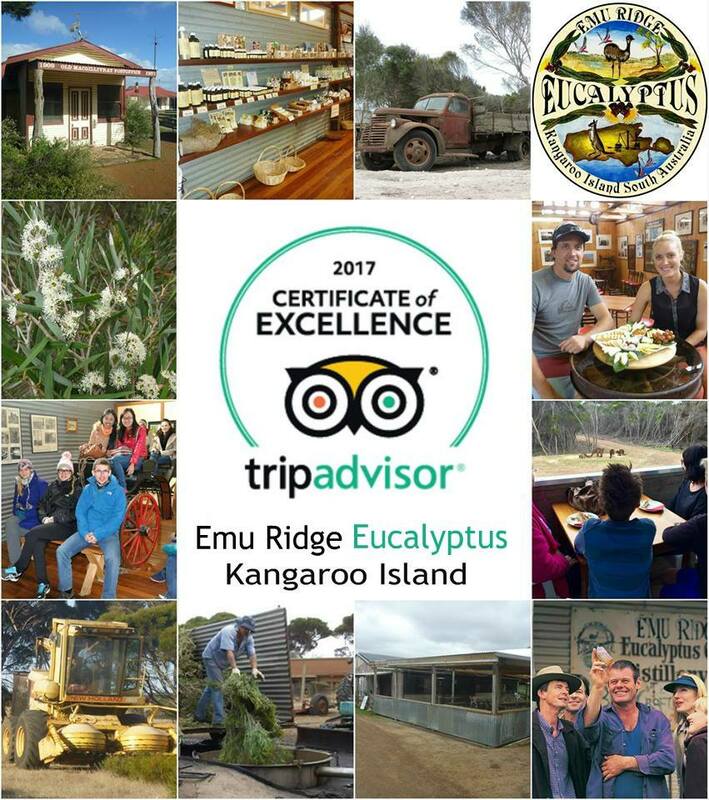 Everything from sharing our favourite Eucalyptus recipe to DIY projects, and even sharing photos and experiences we have here at Emu Ridge. SOME XMAS TRIVIA FOR YOU. For those of you that love multi media technology and have a favorite social network, we are keeping up with the times. We have some great boards that you can follow on pinterest. Instagram is new to me one of our new staff members Lucy will be posting here! Twitter also a new addition will also be handled by Lucy. We hope you enjoy keeping in touch with us via your favorite social network! Our Desserts and Decorations. I hope you have JOY this Xmas creating something for your loved ones. I had FUN decorating our sweets for the Sealink Staff Xmas party, Chocolate Brownie Strawberry Xmas Trees & Santa Hats served with Salted Caramel Ice-cream and Island Delights White Chocolate Island Pure Labneh Cheesecake Strawberry Santa Hats. . . . We hope they enjoyed them. Our outdoor area has had quite a few events these last months. Every time the theme makes it look magnificent and so different every time. BELOW IS TWO OF OUR POPULAR PRODUCTS FOR THOSE OF YOU THAT HAVE SUMMER NOW! 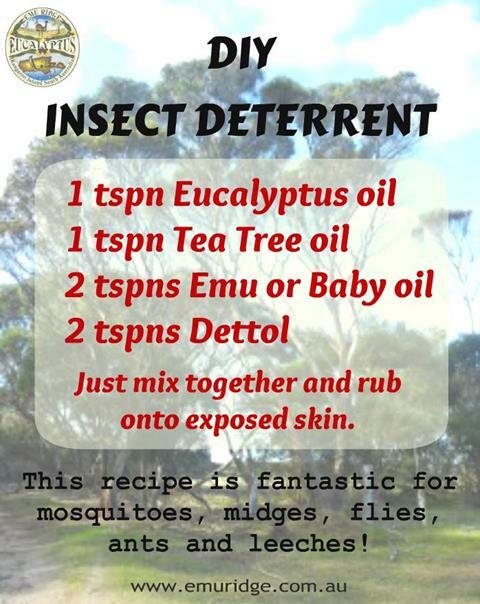 Natural Insect Repellent with Emu Ridge Eucalyptus, Tea Tree and Lemon Myrtle Oil is always popular this time of the year. Just spray over exposed skin and enjoy an insect free outdoors knowing that you haven’t used any nasty chemicals on your body. This natural sunscreen will help protect your skin from the damaging rays of the sun using ingredients that don’t contain toxic ingredients you find in most commercial sunscreens. Thanks so much for taking the time to read our newsletter, we hope you have found it interesting and useful. Have a wonderful Xmas and a fantastic 2016. 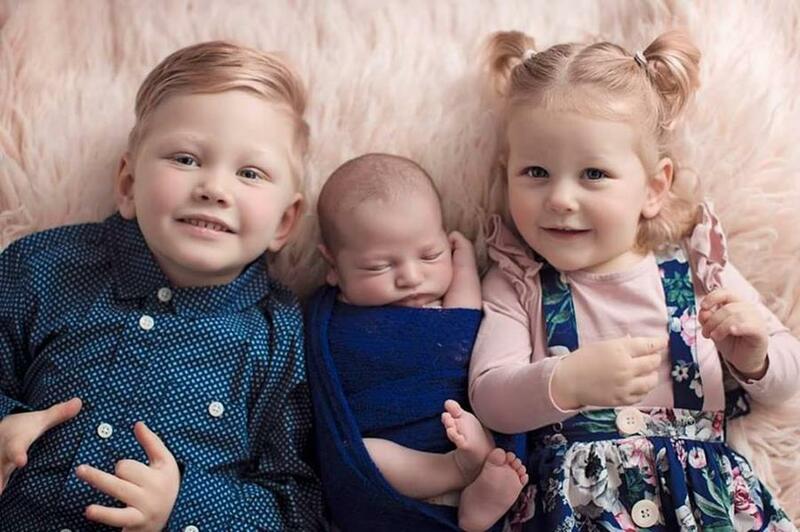 We have all of our family home so its going to be lovely, our 4 grand children growing so fast with another one on the way. Very exciting. Hi from Emu Ridge and beautiful Kangaroo Island. Spring is here and the weather is warming up for us thanks goodness, the beautiful wildflowers are starting to bloom and the birds are singing. We hope you enjoy our third Emu Ridge newsletter. Warm regards Larry, Bev and the Emu Ridge staff. Unfortunatley some people are still suffering colds and flu. These Shower Discs are a great way to clear your sinuses as well as keeping your bathroom smelling fresh. These all-natural eucalyptus vapour discs are simple and easy to make and are non-toxic, so they are safe to use around children and pets. We loved having the work experience girls help make these, we hope you enjoy them too. please see more info on this link. The smell of stinky shoes can be overwhelming and make you want to throw them away. If you click on this link you will find a few great tips to remove and prevent the odors for someone with stinky shoes! our LIP BALM valued at $7.95. GREAT RECIPE FOR CUTS & SCRAPES.. There are many great benefits when it comes to making your own products. Not only do they help you save money, but you also know exactly what’s in them. The chemicals on flea collars are definitely not something we feel good about at Emu Ridge, especially on dogs and around kids who are playing with them and patting them! We hope you find this handy. For more info see our blog and we have lots of other great tips for your pets on our blog. This link here has some handy tips for you as well. Thanks so much for taking the time to read our newsletter, we hope you have found it useful. There are many great benefits when it comes to making your own cleaning products. Not only do they help you save money, but you also know exactly what’s in them. This homemade glass cleaner recipe is a simple, easy to make solution that uses everyday ingredients from around your home. It works effectively and is much better for our environment. Please click for the full recipe on our blog. On Kangaroo Island winter has just begun which means cold and flu season is upon us! So this month’s tip is all about helping to keep away those nasty flu and cold symptoms. With our pure Eucalyptus oiljust add a few drops in the bottom of the shower, or add about 15 drops in a bowl of steaming hot water and inhale, covering your head with a towel. This is great as a decongestant! You can even mix a few drops of our Eucalyptus oil with a carrier oil (e.g. Emu oil) and rub on chest, back and feet. This is a great natural alternative! We also sell our own all natural vapor rub. We would like to offer our Valued customers a FREE GIFT to thankyou for your support. Spend $50 or more this month and mention this SPECIAL from our newsletter when you order to receive our LIP BALM valued at $7.95. Our sweets have always been a popular choice, all natural, no artificial colours or flavours and gluten free. 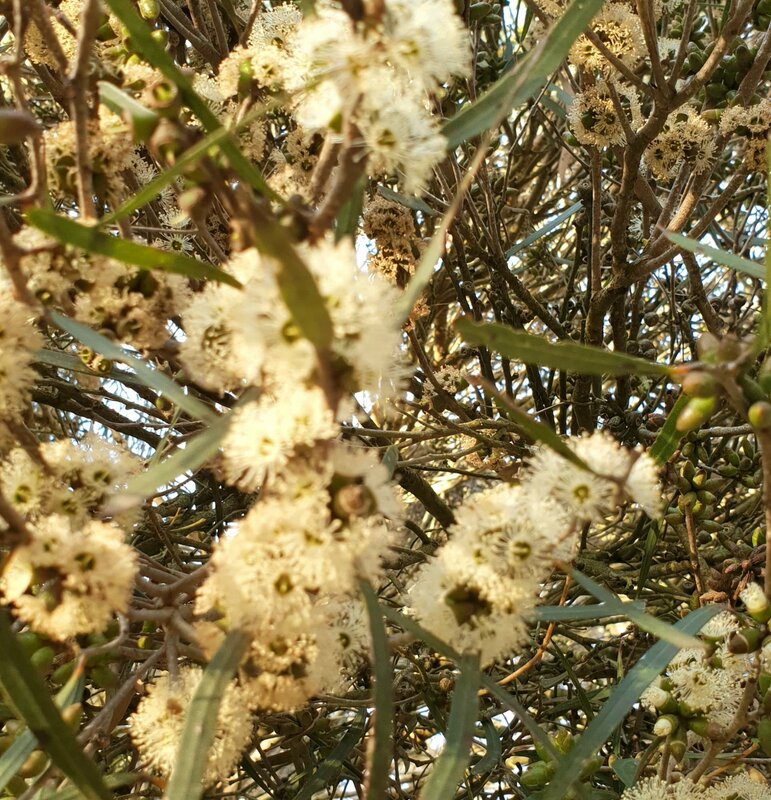 The soothing antibacterial properties of our eucalyptus oil and healing properties of pure Kangaroo Island honey make it effective in clearing your nose, soothing your throat and giving freshness to your breath. DIY – DOG BED MADE OF PALLETS..
One of our popular blogs is a project that shows you how to make pet beds from pallets, this page has some great ideas including tips on how to keep your pet and home free from fleas. We have added a testimonials page to our website. Nothing pleases us more than to hear the wonderful ways that our products have helped, what our customers think and recommend to others. Have a look and see what others have said and we would love to hear from you to. Thanks to those that have taken the time to share thier experience. Much appreciated! Thanks so much for taking the time to read our newsletter, we hope you have found it useful and we hope to get the next one to you on a more regular basis.